12-28 IS a standard size and quite common. Taps and dies are generally available at your local ACE hardware or similar. I've seen them at Lowes. Most gun screws are from the extra fine series and only common in guns and instruments. We've had a couple of 80* days but it cooled off to 35 yesterday morning and is supposed to rain all weekend. Topic: SOLD: Swedish rolling block, "sportered"
Re: FS: Swedish rolling block, "sportered"
I'm really happy someone else has bought this super bargain 'cause I wouldn't be able to resist. Wow! Is that girl kin to J. C. Watts? If you need 1911 mags there is none so good as Wilson makes. I think I have 16 of them. Mostly 7 round but several 8 rounders. They work! My favorite cartridge! 4 lever guns and 6 SAAs. One SAA obtained at yesterday at the Wanamacher. That's really cool Lenn. I'd call Gene (our 9 year old) to see it but Mom's trying to get him to sleep. I'll catch him tomorrow. He asked what channel on youtube had your stuff on it. I have a 6' black snake in my shop and NO rats. She is welcome to stay but her offspring get evicted. Hey EG73, I took some time Friday evening at the Wanamacher and found a really nice large frame in 45-60. Should make an excellent shooter. $10K But it was really nice. I'm glad you got that old reprobate running again JimT. I just have a terrible time not trying to salvage every old SAA I come across. The last few years I've managed to contain myself to Colts although I have tackled a couple of 1877 pistols. Never again. Congrats Shrapnel. Fine bunch of carbines. Hey, Alamagordo is not too far. Just a long hard day behind the wheel. There is a huge RV park that's part of the fairgrounds but reservations would definitely be needed. If you have an RV. You're going to love that rifle! 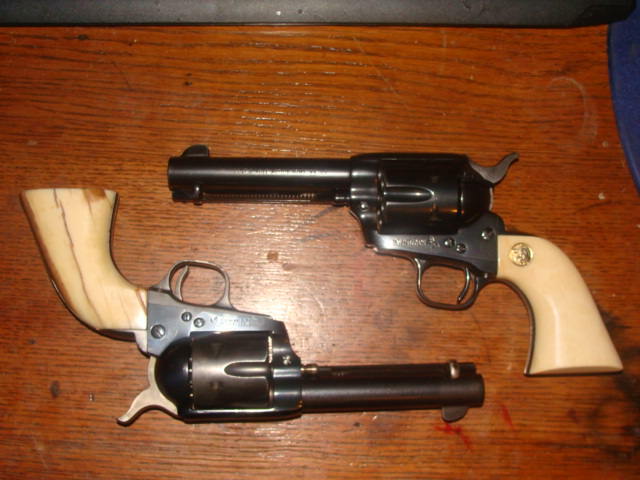 Mine is a SRC in 44-40 and I have an old one from 1895 that is almost identical. Only difference I can find is a pin through the forearm band instead of a screw on the old one. I have 2 Ubertis and the 2 Winchesters. They're all good. The world's biggest gun show is this coming weekend in Tulsa. If you're coming, I'd love to visit with you. I'm on the upper level, row 9, island A. Come see us. I'm happy to hear this news. Had to pass that one along to my household. Oh man! That Starline turned out really nice. Don't you wish you would have just coughed up the cash and bought a Star? I too have an old Lyman and spend all those expensive hours sizing/lubing my stuff, constantly wishing I hadn't sold my push thru machine. Guess I could buy or make another. Good to see you've been busy Lenn. Nice stuff. Winchester model 12, 12 with 6 std lngth mag 4s in magazine. Yes, I could have one in the chamber but I just love what the sound of racking that action has on what went bump. Rube, I wanted to tell you that I bought my new Miroku 73 from cheaper than dirt. Cheapest price I could find. (under a grand) You might want to try Bud's and Classic Arms too. Aw man 7, that is a beautiful rifle. I always wondered what holds up the loading ram...it looks like it would open on recoil....? No Doc, the Dragoon has a latch on the loading lever that actually works. Aquila makes 12 gauge shells that are only about 1 1/2 inches long but nearly full power. My wife uses them in her Remington s x s double. The nice thing about re-lining is the original markings are retained. I have had both 44-40 and 32-20 model 92s re-lined with Redman liners and they both shot exceptionally well. Sounds like your friend might like the idea of retaining the originality of the piece in question. Topic: Do you like prairie dogs? Re: Do you like prairie dogs? I have a whole bunch of BLRs in 308, and a couple of FALs and it's No. 2 Son's birthday. He's 48? Thanks guys, I'm now an octogenarian. Topic: They do have levers. Re: They do have levers. Can't wait 'til you can shoot for distance. Topic: Buffalo Bore's 44-40 "Heavy"
Re: Buffalo Bore's 44-40 "Heavy"
Love that photo, M.M. There is just so very much that is "right" about it. And I ate some of him last night. I'm pretty sure that my fffg loads of a full case compressed and loaded with 200 grain bullets cast of No. 2 alloy will just about equal the BB load. I know it kills deer just fine. I bet it'll shoot a bolt out of sight.